Where Did That Come From? The Origins of Some of Our Favorite Food Expressions. Food has been around as long as we have, and so have the food sayings we’ve worked into our everyday lives. Most of us use food sayings every day without even thinking about their origins. We thought it would be fun to whet your appetite with the interesting stories behind a few of those expressions. So grab a cuppa and read on. Let’s face it – there are those who like the crust, and those who like the soft center of a loaf of bread. This expression, which we use to describe the crème de la crème of our society, comes from those crust lovers, who saw the top half of a loaf as the best part. This French expression literally translates as cream of the cream, and refers to the richest part of fresh milk that rises to the very top before homogenization. We all know how delicious cream is in our coffee, on our ice cream, and well, anywhere, so a person or thing that’s crème de la crème is just as top-notch. You’ll know if you’ve tried it… pie is definitely NOT easy to make! This phrase seems to have originated in the U.S. sometime in the 1800s, and refers to the ease of eating pie, not making it. A 16th century appearance of this expression has it flipped: “wolde you bothe eate your cake, and have your cake?” Either way, the idea with this phrase is that sometimes we have to decide between two things that can’t happen at the same time. But wouldn’t it be great if they could? Are you trying to butter me up? We hope you enjoyed this little taste of word history. And if we’ve made you hungry for more about baked goods, give us a call. For more than 25 years, Bakers Pride has delivered delicious seasonal specialties and perennial favorites daily in the St. Louis area. 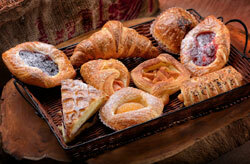 You can count on us for the highest quality fresh-baked goods and on-time delivery. Contact us to see how we can make your food service a piece of cake.